The No. 5 Boston University men’s hockey team traveled to Gutterson Fieldhouse for a pair of games against No. 12 Vermont last weekend, falling 4-2 in Friday’s tilt before cruising to a 4-0 win on Saturday. A lot happened in the last series of 2016. 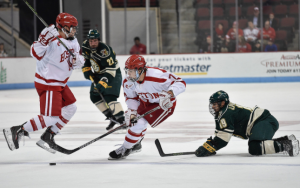 Let’s take a look at the positives and negatives from the Terriers versus the Catamounts.